Welcome to Music Friday when we bring you fun songs with jewelry, gemstones or precious metals in the title or lyrics. 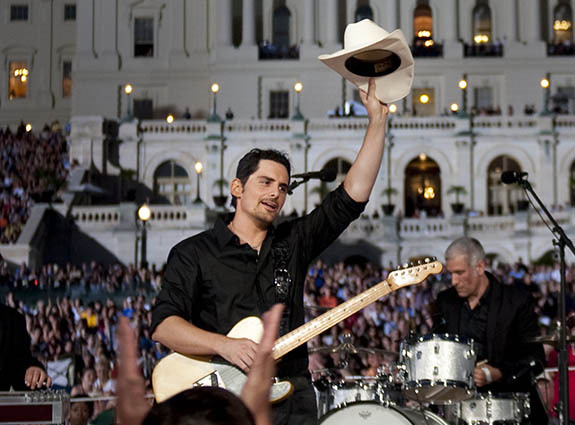 Today, a love-struck Brad Paisley is about to propose to his girlfriend, but accidentally leaves the engagement ring at home in 2001's "You Have That Effect On Me." In the song, Paisley assumes the role of a young man who is so head-over-heels in love that he can hardly think straight. He tells his girlfriend how anxious he's been during the past few weeks — that he's been haunted by the vision of getting down on one knee and forgetting what to say. Each morning, while brushing his teeth, he's rehearsed the lines, but still can't get them memorized. Paisley sings, "You've had your eyes on a 2-carat ring / I finally went out and I bought it / Right now it's at home sittin' on my TV / Would you believe I forgot it." Our hero tells us why he deserves a free pass for his absentmindedness: "You can't blame me 'cause it's plain to see that you have that effect on me." The role of an awkward suitor comes naturally to Paisley, who famously fell in love with actress Kimberly Williams in 1991, but didn't get the courage to call her until 10 years later. Williams starred in 1991's Father of the Bride, and Paisley developed an instant crush when he saw her on the big screen. His feelings only grew stronger when he saw her in Father of the Bride II in 1995. It took another six years before he would finally contact the actress and convince her to go out on a date. Williams told QPolitical.com that they "fell for each other fast." They met in 2001, were engaged in August of 2002 and tied the knot in March of 2003. "You Have That Effect On Me" was the 11th track of Part II, his second studio album — a release that rose to #3 on the U.S. Billboard Top Country Albums chart and #31 on the U.S. Billboard 200 chart. "You Have That Effect On Me"
The 18.4-carat “Rockefeller Emerald” set a new world auction record for the highest per-carat price ever achieved for an emerald when it fetched $5.5 million yesterday at Christie's New York, which is headquartered, quite fittingly, in Rockefeller Center. Described by Christie's as possessing mesmerizing color and impeccable clarity, the Colombian emerald was originally purchased in 1930 as part of a pendant brooch by John D. Rockefeller, Jr., for his wife, Abby. After Abby passed away in 1948, Rockefeller asked New York jeweler Raymond C. Yard to disassemble the Van Cleef & Arpels brooch so the individual emeralds from the setting could be distributed among the Rockefeller children. 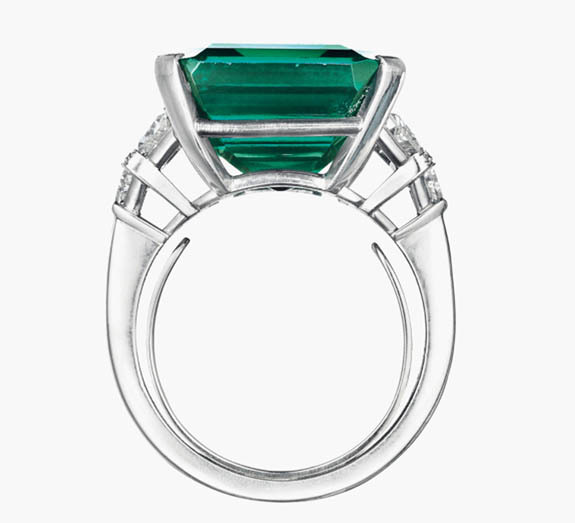 Yard set the center emerald in a platinum ring and Rockefeller gifted it to his son, David. "This is supremely natural beauty," Rahul Kadakia, Christie's International Head of Jewelry, told CNBC. "This truly is the finest emerald that's ever come up for sale at auction, or anywhere else in the world." Christie's noted that the intense color and distinct saturation that typifies a Colombian emerald is illustrated perfectly in this remarkable stone. American Gemological Laboratories described the stone as "exceptional," possessing what AGL calls an "unusual combination of size, provenance, absence of treatment and quality factors [that contribute] favorably to its rarity and desirability." The Rockefeller Emerald's per-carat price of $304,878 edged out the $281,329 achieved by the previously record holder — a 23.46-carat emerald-and-diamond pendant brooch formerly owned by actress Elizabeth Taylor. 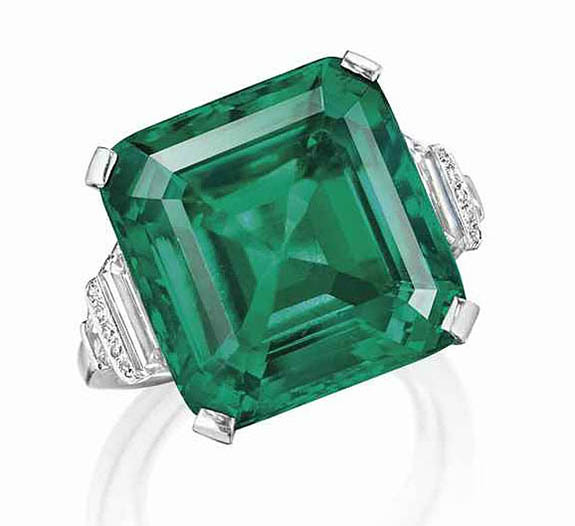 That Bulgari brooch was sold by Christie's New York for $6.6 million in 2011 as part of the landmark auctions of “The Collection of Elizabeth Taylor” and still claims the record for the highest price ever paid for an emerald jewel. Members of the Rockefeller family are often characterized as American royalty. John D. Rockefeller Jr. was the only son among five children of Standard Oil co-founder John D. Rockefeller, America's first billionaire. During the Great Depression, "Junior" developed Rockefeller Center, an impressive complex of midtown Manhattan office buildings, which he called the "city within a city." "It's very, very cool that we have this city within a city, selling the stone that belonged to the man who built it," Kadakia told CNBC. Credits: Rockefeller Emerald images courtesy of Christie's. The silver-tone promise ring — featuring green and red jewels — was recovered from their bullet-riddled ’33 Ford Model B by Sheriff Smoot Schmid after the "Sowers Raid" in November 1933. Bonnie and Clyde fled on foot, escaping the police ambush despite wounds to their legs from the bullets that passed through the car. The legendary couple famously robbed banks and evaded the law for two years until they met a tragic demise in 1934. Bonnie was 23 and Clyde was 25. 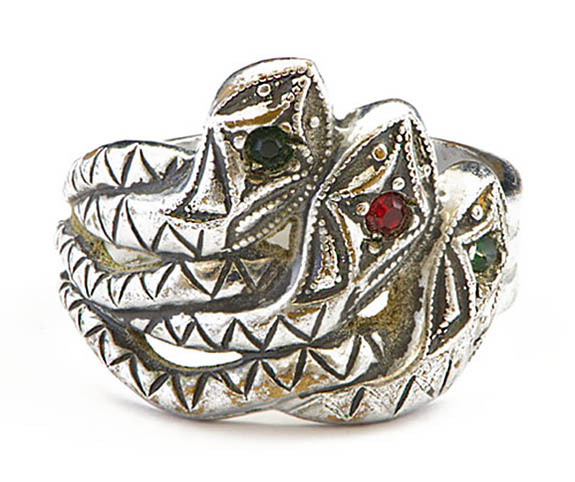 This promise ring, which is expected to fetch $40,000+ at the auction house's “Gangsters, Outlaws and Lawmen” sale on June 24, is recorded in Sheriff Schmid’s inventory as “Bonnie Parker Ring (3 Silver Snakes with Tiny Jewels)." 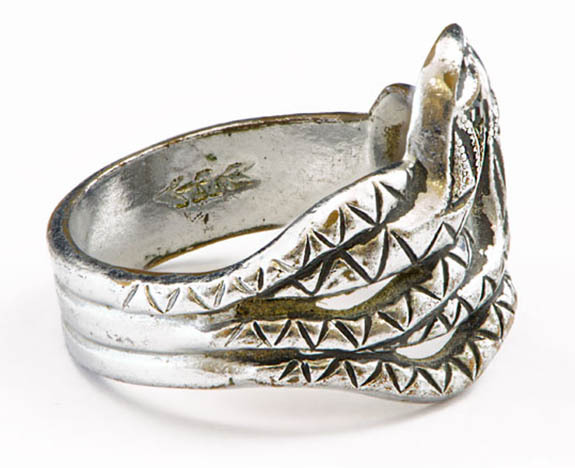 The snake ring he crafted in 1930 while incarcerated at Eastham Prison Farm near Huntsville, Texas, bears his personal trademark, an arrow passing through the musical note "B." The arrow in his maker’s mark may be that of Cupid, symbolizing his love for Bonnie, or it may be a clever, graphical way to spell out his last name, [B]arrow. He likely carved the design from a block of wax and then fabricated the ring from copper using the lost-wax casting process. The final step was plating it in silver. The couple's exploits were romanticized in the 1967 blockbuster film, Bonnie and Clyde, with Faye Dunaway and Warren Beatty playing the title roles. Bonnie and Clyde captured two Academy Awards, including Best Cinematography. Interestingly, at the time of her death, Bonnie was wearing the wedding ring that was given to her by Roy Thornton, who she married just before her 16th birthday in 1926. Their marriage crumbled when Thornton was jailed in 1929. 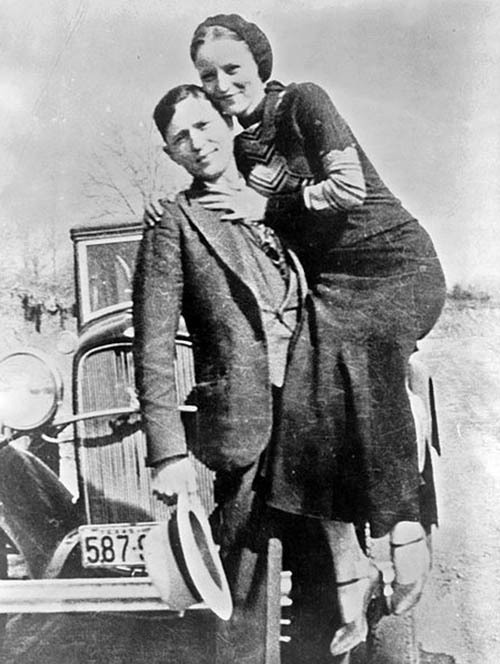 Bonnie met Clyde in 1930, and they immediately fell in love. Two months later, Clyde would become an inmate at Eastham Prison Farm, where he would test his jewelry-making skills. Although they were never formally engaged, the three-headed snake promise ring remains a powerful symbol of two of America's highest-profile antiheroes. Credits: Jewelry images courtesy of RR Auction; Bonnie and Clyde photo by one of the Barrow gang [Public domain], via Wikimedia Commons. 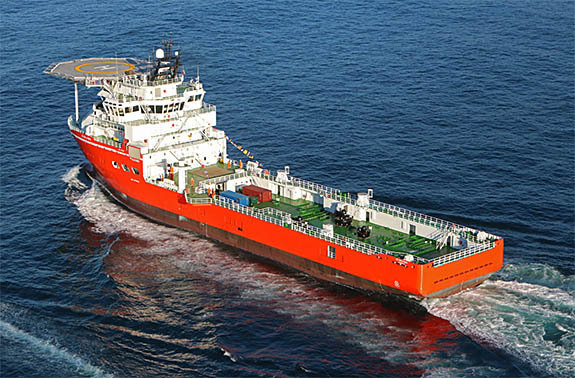 Outfitted with state-of-the-art sonar technology and drilling devices, the mv SS Nujoma is ready to start probing the ocean floor for valuable diamond deposits off the coast of Namibia. 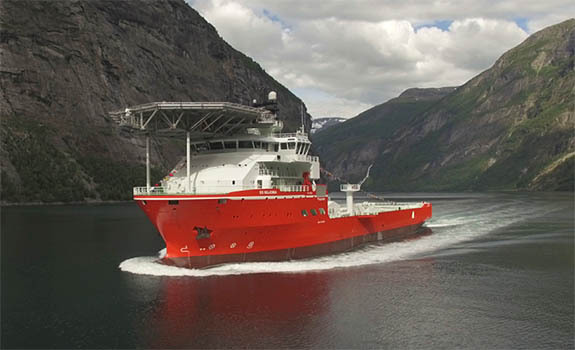 It's the sixth and most advanced vessel in De Beers's growing fleet. 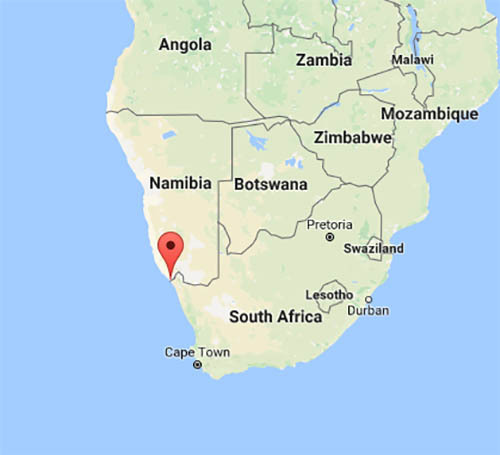 The new vessel was officially introduced Thursday at an inauguration ceremony, which was attended by De Beers and Namibian officials, including the ship's namesake, Namibia's founding president Sam Nujoma.